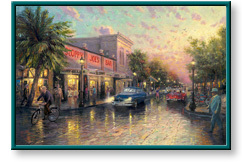 Key West and other artwork by artist Thomas Kinkade can be viewed in our artist slideshow. Key West by artist Thomas Kinkade and other Thomas Kincade art, art work, artwork, canvases, giclees, images, limited editions, open editions, paintings, paper, pictures, posters, and prints can all be found at Christ-Centered Art. "Discover a city where real estate titles date back to the Kings of Spain. Stroll the palm-lined streets and discover gingerbread mansions, tin-roofed conch houses, the John Audubon House, and the home of Ernest Hemingway. Walk in the footsteps of Thomas Edison, Lou Gehrig, Harry Truman, and Tennessee Williams. "I have hidden a number of world figures in my Key West print, most notable Ernest Hemingway, who stands in front of Sloppy Joe's Bar, where he held court during his last years. "In the clear air and luminous sky of the Caribbean, colors rise to vivid heights. I utilized a broad stroke technique along with much fine detail to capture the festive atmosphere of Key West. Between ten and twenty layers of paint, featuring delicate glazing, create the opalescent hues of the Caribbean." Key West by artist Thomas Kinkade as well as other open and limited edition inspirational paper art prints and canvases, giclees, images, lithographs, paintings, pictures, posters, and reproductions by renowned Lightpost Publishing, Media Arts, and The Thomas Kinkade Company artist Thomas Kincade can be viewed and purchased at special sale prices at Christ-Centered Art.